USB/ MIDI Master Keyboard. Features: 61 Semi-weighted keys 9 Motorized and touch sensitive 60 mm faders 8 Lighted endless encoders with LED ring for visual DAW feedback 8 Velocity and pressure sensitive pads with colored lighting. Large backlit LCD display. Mackie control protocol automapping. Transport buttons. Each 4 banks of faders, encoders and pads. Built-in arpeggiator. Dial incl. push encoder function. Pitch wheel. Modulation wheel. USB-MIDI. DIN MIDI each 1x in/ out/ thru. 6.3mm Jack input for 1x sustain and 1x expression pedal. Windows and Mac compatible. Power supply connector and power switch. Dimensions (L x W x H): 83.3 x 30.5 x 6.8 cm. 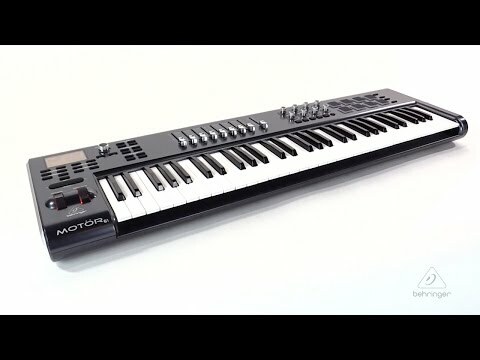 Do you own Behringer Motör 61 or have you had a chance to try it?